It's a good thing Bob Dylan doesn't care if anyone likes his records. If you think about it, it's hard to imagine an artist with less of a chance of getting a fair shake. Now, hold on - I know what you're gonna say: he's a legend, people are going to say they love it no matter what. But is blind obeisance a fair shake? And those whose knees jerk that it's not as good as his 60's work - are they really listening? In my own case, the first listen to a new album from Zimmy can be a angst-ridden affair. Somewhat recent masterpieces like Time Out Of Mind and "Love and Theft" (not to mention the many classics from his past) have brought so much pleasure into my life and I want nothing more than to have the new one join them. It's almost too much for any record to bear - thinking about how the voice sounds, if the lyrics are any good, or if the production is too slapdash. Together Through Life, his last album of originals, was that rare thing in Dylan's later career: a merely good album. The production was too slapdash and the lyrics were often just ok. I'm still convinced Robert Hunter, who co-wrote the words to most of the songs, was the main culprit. Dylan doesn't need a co-writer - he has enough help from the ghosts of long-dead poets and songwriters. Together Through Life was a good listen with a couple of excellent songs, but it just didn't get under my skin like the three that preceded it. The Dylan promotional machine is a fearsome affair, so even before I had heard Tempest, I had received several emails about the record and was aware of the songs Cinemax's Strike Back was using. They sounded pretty good, but that's not the same as being alone in your car, stuck in traffic, and pressing play on your iPod. Duquesne Whistle started up and I was tense (the traffic wasn't helping), thinking my way through the song: "Wow, his voice is wrecked, but is it too wrecked? And what is it about, are the lyrics interesting? Sounds good, better production for sure, great band - man these guys swing - how about the song structure, was that bridge inevitable or a bit forced, blah, blah, blah..."
What a crappy way to listen to music. Then the next song, Soon After Midnight, came on and, by god, he's crooning. If the guy in the car next to me on the Grand Central Parkway had looked over at that moment, he would have noticed me visibly relax in my seat. Main thought: "Oh! He can do different things with his voice!" And I spent the rest of the song actually listening to a sweet new-old tin pan alley tune. The rest of the first pass pretty much continued in the same way, over-thinking in alternation with plain listening. When it was over, I thought "Hey, you've got Soon After Midnight, Scarlet Town, then that one where a guy kills another guy and then she kills him and then herself (Tin Angel), Early Roman Kings cooked, the Titanic song was cool, and the John Lennon tribute was really sweet...hey, we've got half, maybe 2/3rds of a great album here!" That was just the start of my love affair with Tempest. After many listens now, each song strikes me as a potential classic (except for maybe Duquesne Whistle - Robert Hunter again - which is like a light overture). The sense of a master craftsman at the top of his game and fully engaged with his art is palpable throughout the album. The wicked delight he takes in lines like "Set'em up Joe, play "Walkin' The Floor," play it for my flat-chested junkie whore," (from Scarlet Town) or "I ain't dead yet, my bell still rings, I keep my fingers crossed like the early Roman kings," (from Early Roman Kings) quickly became my own. And there are stunning lines and gripping tales throughout the songs in the collection. Granted, when Dylan interfaces with historical events, as on the title track and Roll On John, he comes out with some truly weird things. As far as we know, there were no brothers killing brothers or traitors and turncoats on the Titanic (though we can't be totally sure), and Leonardo Dicaprio was only in the movie. Jim Dandy? He's just along for the ride*. But Bob's not writing history here, he's making art. The refrain in Tempest is of a "watchman" who "dreamed the Titanic was sinking" - perhaps that's Dylan himself and the whole song is based on a nightmare after having too much tequila and nachos while watching the Cameron flick. Or he's just creating metaphors to drive home what may be one of the points of the song, that tragic circumstances bring out the best and worst in people. What matter, after the third listen you'll be singing along and salting your Bushmill's with tears. As for Roll On John, the line "They tied your hands and they clamped your mouth" is definitely unexpected. But it's just more metaphor - even skimming a biography of Lennon would give make it obvious that he felt stifled by being a Beatle and trapped by success. Why shouldn't Dylan include that in a song about his friend? The chorus, however, is perfect: "Shine your light, move it on, you shined so bright, roll on John." Thanks to Dylan's mastery, I now have a painful window on what Lennon's murder felt like to someone who knew him. It's a brave and personal song and I think people will be singing it for a long time, which can said of a number of songs on this wonderful album. A note about the singing: there are people who think Dylan was never a good singer. The fact is that he is extraordinarily skilled and has only gotten better. His instrument is a shadow of it's former self, like Billie Holiday's was at the end of her career, but his phrasing - the way he elongates or clips words, pushes them into the next word or uses subtle inflections - is better than ever. Listen through the crackle, like on an old record, and there is a textbook of technique here. Finally, the production. Working under the name Jack Frost, Dylan produced Tempest himself and it's one of his best sounding records. There is the feel of a band in a room playing together, almost casually. But I sense that is a deception, as there is a gleaming richness and depth to everything on the record that is quite beautiful and obviously considered. The band is excellent, with Tony Garnier deserving special mention for his work on acoustic bass. Dylan must like it too, as it is recorded to a fare thee well. The burnished sound is a crucial element to the hypnotic spell Tempest can cast, especially in circular songs like Scarlet Town and Tin Angel. 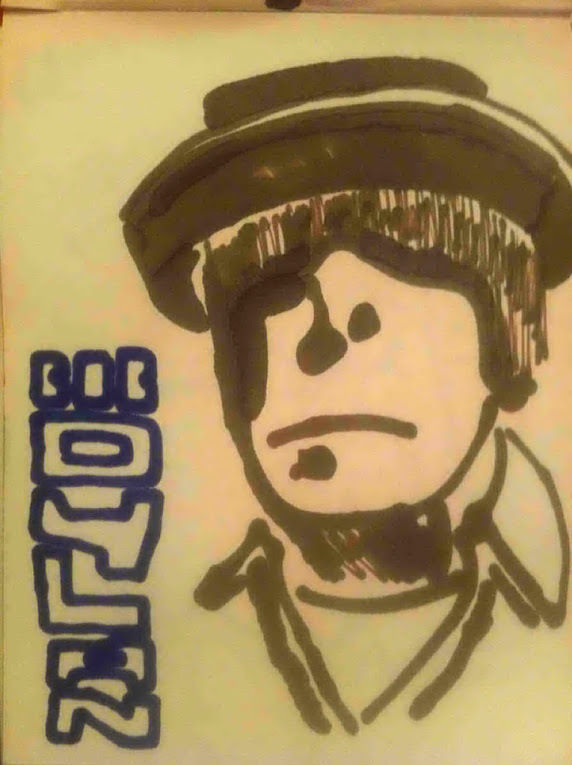 Even though he doesn't care who likes his albums or not, and has a conflicted relationship with the act of making records in general, I think Dylan took Tempest pretty seriously. When lines like "I wear dark glasses to cover my eyes, there are secrets in them I can't disguise. Come back baby, if I hurt your feelings, I apologize," are coming, you want to place them in the right setting. Bob knew he had ten good ones and did them proud on Tempest. The rest is up to you. In the words of Dylan himself: "If I can't work up to you, you'll surely have to work down to me someday." *I (and some others) originally thought it was "Jim Backus," which would have been hilarious - too bad! The tear-jerker of a line is: "Jim Dandy smiled, he never learned to swim, saw the little crippled child, and gave his seat to him." I'm part of a group on Facebook called Declare Yourself: 30 Days of Daily Creativity and for the month of September I have been posting a "musical portrait" each day. Over time, I will be sharing them here as well. I felt it was only appropriate to start with one called The First Musicians. My nephew had his bar mitzvah earlier this month. It was a beautiful event and the music was very well done - folk/middle eastern/Jewish melodies played on guitar, violin and doumbek (a hand drum). The rabbi talked about one song being derived from the prayer the Jews chanted while crossing the Red Sea. It was a powerful image and it threw my mind back to thoughts I've had about the creation of music. Our very ancient ancestors lived in a world where the struggle for survival was paramount. The fact that they took the time to create instruments and invent a musical language - some say it was the first language - is a reminder of how central music is to the existence of humans from our earliest days. 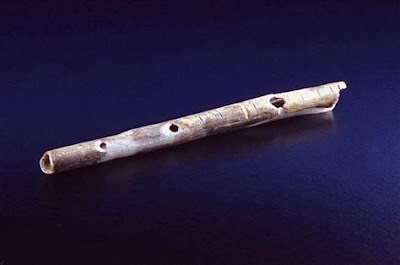 Pictured is a 40,000 year old flute, carved with stunning skill from the leg bone of a bird - presented here in tribute and gratitude to the first musicians. This photo comes from a story on NBC News. The great film director Werner Herzog seems to share my affection and fascination with our ancestors, as shown in his wonderful film Cave of Forgotten Dreams (see it in 3D if you can). Although it is impossible to know what their music sounded like, this clip shows that the flute is capable of being played in tonalities that are instantly recognizable.